PolyBase, which was released with SQL Server 2016, provides another method to access live data either locally or in the cloud, very similar to the SQL Server Stretch database feature. Polybase can also provide the ability to provide a more cost-effective availability for cold data, streamlines on-premises data maintenance, and keeps data secure even during migration. Polybase differs from Stretch database in a few ways, as the SQL must be different, the speed is noticeably slower, and it is a lot less expensive. The cost is significantly less because storing data in a Azure blob store starts at 1 cent a month and Stretch database starts at $2.50 an hour. In this post,I will show how to take data which was archived due to the age of the data, which was created in 2012 and store it in an Azure Blob Storage file which will be available via Polybase when I needed. PolyBase is an optional feature of SQL Server 2016, and the Instance Feature PolyBase Query Service for External Data needs to be selected as part of the installation process. Two services are installed with the feature, SQL Server PolyBase Engine and SQL Server PolyBase Data Movement. Both of these services must be running and TCP/IP must be enabled for PolyBase to work. Either check for those services or run the query SELECT SERVERPROPERTY (‘IsPolybaseInstalled’) AS IsPolybaseInstalled; which will return a 1 when PolyBase has been installed. The next step is to tell SQL Server what the external source is by configuring which Hadoop Connectivity will be used. To use Azure Blob Storage, there are 3 different options, 1,4 and 7, which include the ability to access blob storage. These options also allow for various other Hadoop engines to be accessed as well. I have selected 7, which also allows me to use Hortonworks on Linux. For more information on the connectivity options, check out this link. A secure database ke is required to make the connection a well. The next step is to let SQL Server know where exactly the blob storage data is stored, which creates an entry in the External Data Sources. PolyBase needs to know how the data is formatted, which will be stored in an External File Format. By definition, Hadoop data has no schema, so a schema is going to have to be created and stored in an external table. The location for each of these items is stored within SQL Server Management studio as shown here. A PolyBase will need the Azure Blob Storage key to be able to make a connection. 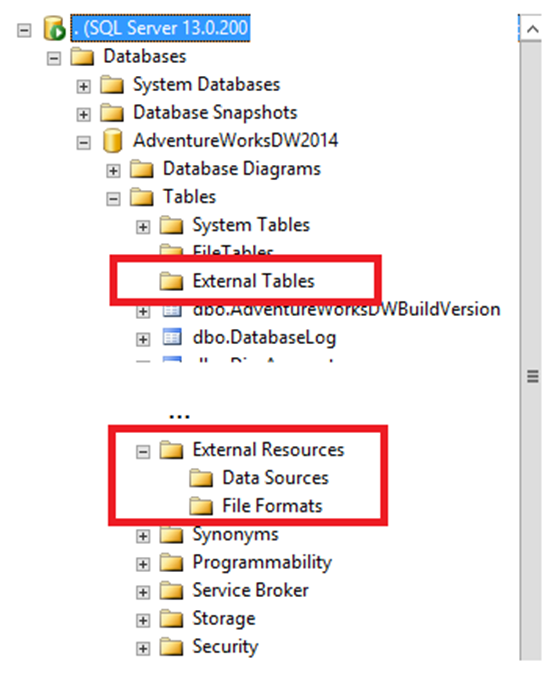 All of the external tables created can be found in the DMV sys.external_tables or by looking at sys.tables where the new column is_external is set to 1. Once the setup of PolyBase is complete, I can query the external and internal tables all at the same time, like I do here. It is not possible to edit the data in PolyBase, as the data is stored read only. Also since the data is being pointed to externally, it cannot be indexed and querying it is not terribly quick. All of the data will be brought down and then filtered, unless PolyBase is configured to improve performance, which I will discuss in a future blog post. PolyBase and Azure Blob Storage provides the ability to access data stored offsite in a secure location in a cost effective manner. If you saw my presentation on this topic at PASS Summit or have questions how to make it work in your environment, please contact me on twitter or write a comment on my blog. Pingback: Partitioned Views With Polybase | 36 Chambers - The Legendary Journeys: Execution to the max!